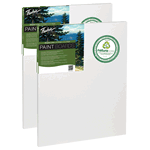 Painting panels are a great choice as an alternative to traditional stretched canvas. Choose from a variety of options including raw wood painting panels, canvas panels in a variety of finishes and gessoed hardboards. The possibilities are endless.